Don’t mind our sticky look…Jason and I showered that day with a bucket by the water fountain (in our swim suits, of course) because there were no showers. It was kind of fun, acutally. We hiked for an hour and a half and got pretty sweaty after that. Needless to say, I don’t think any of us were sporting our “smile for the camera” look. The first night we ran into a minor problem that was fixed by some quick thinking. I was grilling turkey burgers and two veggie burgers on our tripod over the grill. I was lowering or raising the grate when all of a sudden a hook slipped loose and the entire grate fell down into the fire. Luckily it fell in the direction it was hanging and we were able to salvage 5 of the 7 turkey burgers. Sadly, the veggie burgers did not make it 😦 I settled for pasta salad and a delicious baked potato (which we made both nights by stabbing a potato with a fork, wrapping it in tin foil, and throwing it in the fire pit around the outside of the flames…45 minutes later you have a perfect baked potato). The second night we went for an easier option – foil dinners. Kathryn and I assembled them while the boys made fire (what is it about boys and fire?). These are simple meals that can be pretty much prepped before camping. I cut the veggies ahead of time and stored them in individual containers in the cooler. 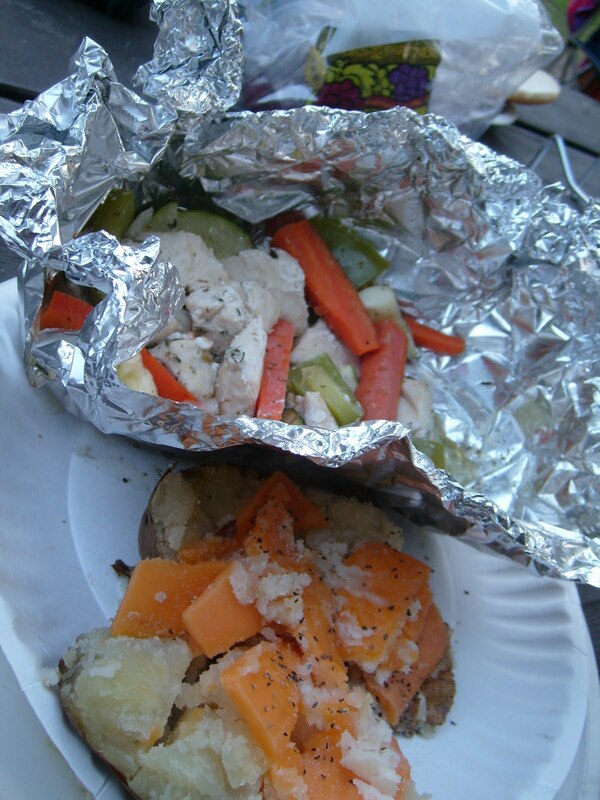 Usually we put potatoes in them, but opted for baked potatoes again (since they were so good) and stick with chicken and veggies in the foil dinner. I didn’t wear a watch all weekend so I have no idea how long they took – I am guessing 30 minutes. 1. Cut a piece of HEAVY DUTY (not the normal flimsy stuff) tin foil about the size of a piece of paper. place the chicken in the center and top with the desired veggies. Season liberally with the above mentioned seasonings. 2. Fold the edges up to make a box opening. Roll the edges down like a brown-bag lunch. Place in the fire or on a tripod (we placed them on the tripod). If you place them in the fire, keep them in an area where you would be comfortable reaching in to grab them with metal tongs. **Most recipes call for a splash of water. We did this and it made the dinner soupy. I omitted the water because the raw chicken, onions, and zucchini will all let off enough water to steam the dinner. If you are putting potatoes in and/or precooked meat, add a little water. 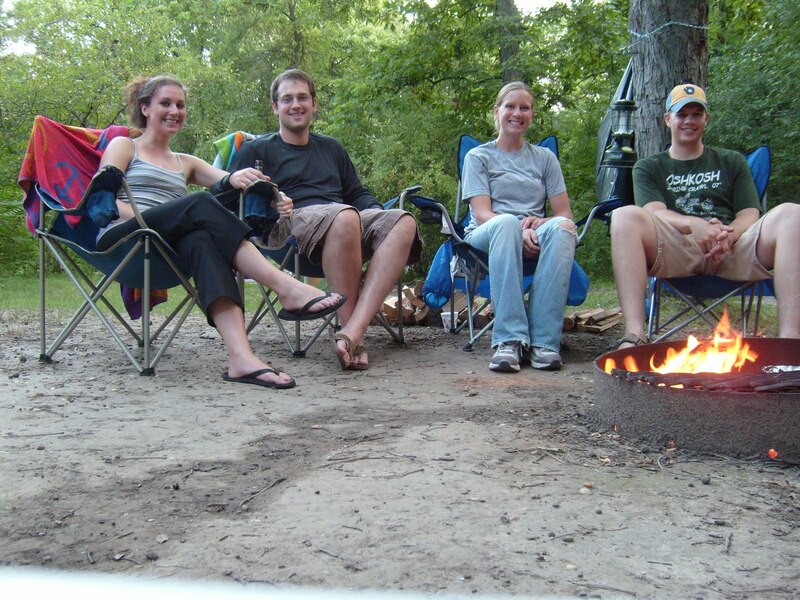 This entry was posted in Nutrition and tagged camping, Meals. Bookmark the permalink.